How different Shakespeare’s plays would have been had bicycles existed in his day. Richard III might have declared: “A bike! A bike! My kingdom for a bike!” and that famous stage direction in The Winter’s Tale “exit, pursued by a bear” may not have resulted in the death of poor Antigonus. This month an all-bicycling theatre company giving new meaning to the phrase ‘play cycle’ by pedaling more than 1,000 miles across the country to perform Shakespeare. The Handlebards are two acting troupes (one male, one female) with four members each. They load up their bicycles with set, props and costumes and perform Shakespeare on the hoof in a manner they describe as “energetic, charmingly chaotic and environmentally sustainable”. On a national tour of more than 50 venues, the group’s all-female crew will be stopping off at the Geffrye Museum for “knee-slapping, inventive, off-the-wall,” performances of two Shakespeare classics: Romeo and Juliet, his tale of star-crossed lovers, and early comedy The Taming of the Shrew. 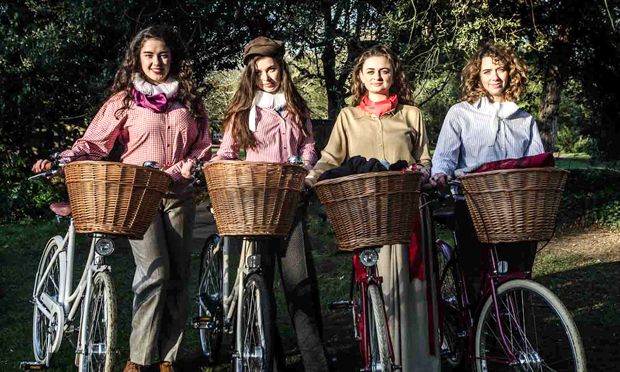 The cycling actors embarked on their first tour in 2013 and have performed in schools across the country as well as performing in India, Singapore, Malaysia and Myanmar. In 2014 the group won the Edinburgh Fringe Sustainable Practice Award for saving 50.2 tonnes of CO2 by travelling by bike.